Chesapeake Beach, MD - Plan your visit. Chesapeake Beach, in Calvert County Maryland, was founded by the Washington and Chesapeake Bay Railway Company in 1894 as a resort destination for visitors from the Washington D.C. area. It’s still a popular spot today, with the waterfront Chesapeake Beach Resort Hotel, a fleet of charter fishing boats, a water park, beautiful views, beach access, and several large marinas nearby. Want to see real time photos from Chesapeake Beach? Here’s a web cam from the Rod N Reel dock. Chesapeake Beach thrived as a destination resort during the early 1900’s. The train station that brought early visitors arrived to the area remains as a museum which recounts the history of the resort town. Things to do in Chesapeake Beach include taking a charter fishing trip, going to the beach, visiting the Chesapeake Beach Railway Museum to learn about the area’s history, cooling off at the Chesapeake Beach water park, or try your luck at the Chesapeake Beach Resort and Spa’s gaming rooms. Visitors can also use Chesapeake Beach as a home base for exploring other places nearby, such as Maryland’s capital city of Annapolis and the diverse attractions of St. Mary’s County. 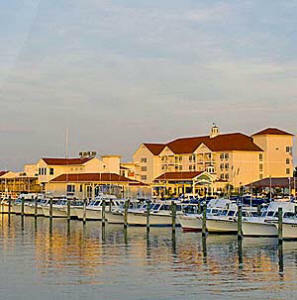 This is the hotel actually located in Chesapeake Beach, located next door to the Rod n Reel Marina. The Holiday Inn Express Prince Frederick is a 100% non-smoking hotel located about a 25 minute drive from Chesapeake Beach. Amenities include Express Start breakfast, Wi-Fi, and bedside recharge outlets. Call Now: 877-926-0076 or book direct online to get their Best Price Guarantee. Find more places to stay nearby. Chesapeake Beach, MD – The official town of Chesapeake Beach website. Choose Calvert – Calvert County, Maryland’s official tourism website.